The first Asset-backed token that is secured by 200% in real assets with market value. StoneToken - is the first Token that is secured by 200% in real assets with a market value. 1 StoneToken=1 cubic meter of crushed stone. 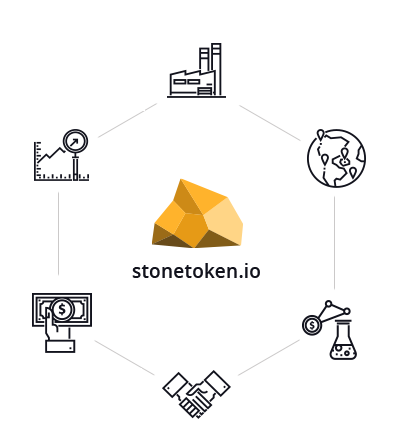 StoneToken ICO is the blockchain-based project of Tokenization of real stocks of raw materials-the underlying asset (crushed stone), located in Slantsy, the Leningrad region of the Russian Federation and held on the balance sheet of the company " Pervaya GoK". The goal is the construction of a plant for production of mineral powder with capacity of 200,000 tons/year in the city of Slantsy, Leningrad region, RF. Our main advantage is the ownership of huge reserves of raw materials (10 million cubic meters.). The low cost of raw materials, successful completion of ICO and no need to pay Bank interest rates will affect the pricing of the final product. All this will allow us to sell products at below market prices. Mineral powder is a flour, a powder obtained by drying and grinding of the carbonate sedimentary rocks of chemical origin . The scope of application of powder: road construction, mortar, tiles, manufacture of glass. In agriculture is used as an additive in animal feed and for soil deoxidation. A wide range of applications ensures products of high demand. The consumption of mineral powder increased from 2012 by almost two times, up to 7 million tons per year. According to our marketing studies, consumption growth will continue and by 2020 will reach 10-11 million tons. ICO Team reward - 1%. availability of own raw materials base, which will ensure the workload in at least 15-20 years. the cost of raw materials, which is 60 rubles/m3 (1 USD), which is 150%-200% below the market price. This gives us the opportunity to offer the products at more than competitive prices. constantly growing demand for mineral powder - increase of consumption since 2012 almost twice. Smart Contract terms that guarantee investors control over more than 80% of the collected funds. Fixed assets can be withdrawn only after loading into the Smart Contract Contracts for the manufacture and supply of equipment. The project initiator of has no right to make changes to White Paper after the start of Pre-Ico and ICO. The absence of changes is confirmed by the Hash Code. All risks of the investors are guaranteed by our raw materials in stock. The second important factor is that the cost of raw materials is far below market because is presented in variant wholesale implementation. In terms of our ICO, in case of its successful completion and collection of the minimum required amounts, any holder of a Token may exchange it for the real quantity of raw materials. We will show all the stages of construction of the plant. We`ll install online-WEB camera. Optionally, the investor may disclose your personal data and get a share in the company. This condition also applies in the case if the investor have more than 5% of the Tokens from the amount of emission. Investments in Stonetoken are protected. We are not a startup, but a real company operating in the market for more than 5 years. Our Token is fully provided with real raw materials that have market value. We guarantee the Bay Back of our Token. We also guarantee every customer the opportunity of obtaining the real product. More detail in White Paper. The plant construction will be under control of equipment manufacturer. The site will be prepared in accordance with the requirements of the equipment manufacturer. The plant will use the most modern equipment that will produce products that comply with all buyers requirements . Launch the project on the Ethereum platform. The first stage PRE-ICO closed! The end of the first stage of Bounty company.